Avian Adventures Mediana Bird Cage features: Spacious and nicely designed bird cage available in dometop and playtop style. The outside dimensions of this bird cage are 34" x 24" x 68", inside height of playtop is 33" and dometop is 40". 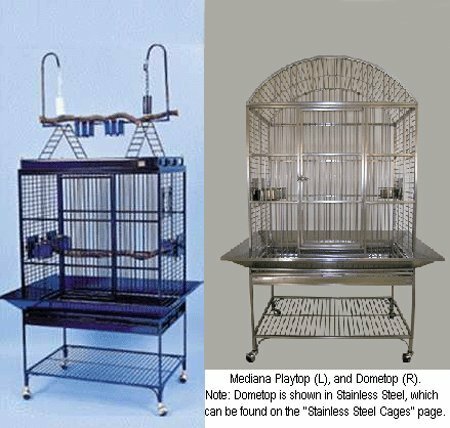 This medium bird cage's features include slide-out grates that will not allow your bird to escape when grate is not in place, specially designed seed guards with no bolts or clips, swing-out feeder doors with new locking system on doors that are easy for humans but not for birds, interior food bowls that are accessible by solid swing open doors so you never have to reach inside the cage, storage shelf for food and treats, and perch that is made of yellow-cow wood which is lighter yet harder than Manzanita. 7/8" bar spacing. 4.7 mm bar gauge. Playtop has lift-off design, 2 perches, 2 interior food/water cups along with 2 toy hooks that lock onto playtop to keep bird entertained. Dometop has nest box doors for breeding, 3 interior food/water coups with 4 inside toy hooks. 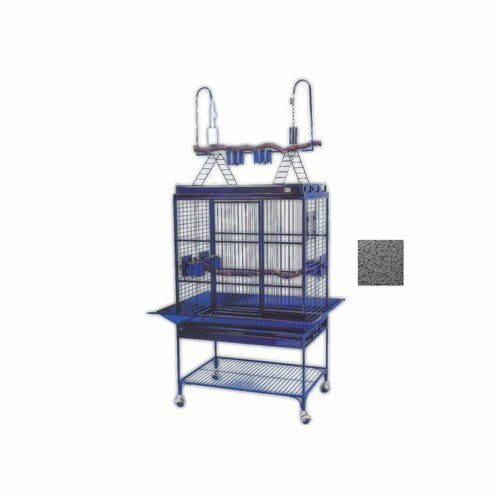 Mediana Bird Cage is ideal for African Greys-Congo & Timneh, Amazons, Eclectus Parrots, Small Cockatoos, and other similar sized birds. Avian Adventures Hacienda Dometop Bird Cage - 48"
Hacienda Dometop Bird Cage features: Your parrot will have a mansion of a home with this bird cage! 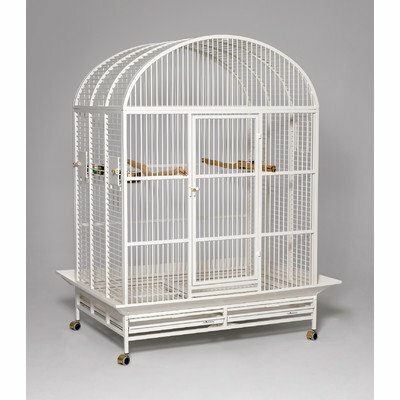 The Hacienda Dometop Bird Cage is one of our biggest bird cages we carry! 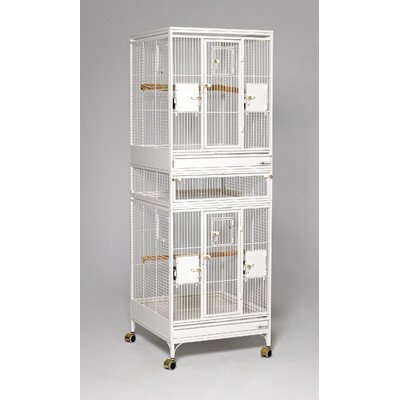 The outside dimensions of this large parrot cage are 48" x 34" x 70" with an interior height of 60". 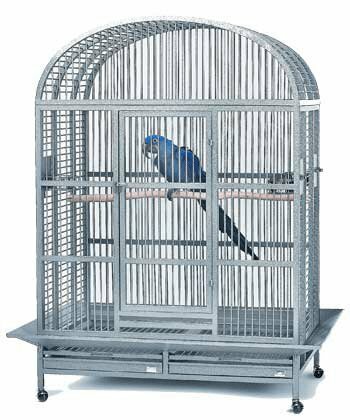 This large bird cage's features include slide-out grates that will not allow your bird to escape when grate is not in place, specially designed seed guards with no bolts or clips, swing-out feeder doors with new locking system on doors that are easy for humans but not for birds, interior food bowls that are accessible by solid swing open doors so you never have to reach inside the cage, and perch that is made of yellow-cow wood which is lighter yet harder than Manzanita. 1" bar spacing. 6.35 mm bar gauge. Nest box doors for breeding, and 3 stainless steel food/water cups along with 4 inside toy hooks that lock onto playtop to keep bird entertained. Very easy assembly. Wrought iron construction and non-toxic powder coated finish available in multiple colors. The birds will flock to this feeder for the food--but they'll probably enjoy the beauty of the design while they're dining. A lovely glass mosaic pattern adds dimension and reflects sunlight to further enhance your outdoor decor. Ideal drinker for chickens, poultry, and birds. 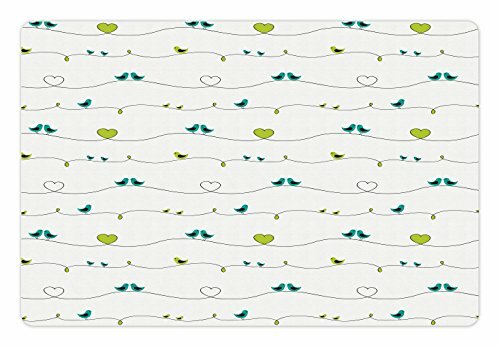 Made from strong durable plastic, it's super easy to clean and refill, and it will never rust. Sturdy twist lock drinker can be carried even when it is completely full. To refill, simply turn the drinker upside down, twist off the base, and fill it up. Freestanding design, no need to assemble anything, simply fill up and let your chickens enjoy the hydration. Twist lock durable design limits spillages. Set of 2 drinkers. Bottle: 7 inches tall x 3.5 inches diameter. Base drinking bowl: 6 inches diameter. Color: Green and white. Terrific value. Fast Shipping. 1705008205 Color: Pearl White Features: -Includes 2 stainless food bowls and a Bakau hardwood perch per unit. 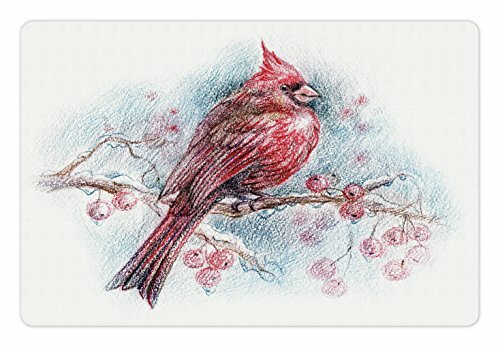 -Suggested breeds include: Canary Cages, Cockatiel Cages, Finch Cages, Lovebird Cages, Parakeet Cages. -Bird proof door locks. -Premium hygienic stainless steel food cups. -Top open to provide an additional play area for your bird. 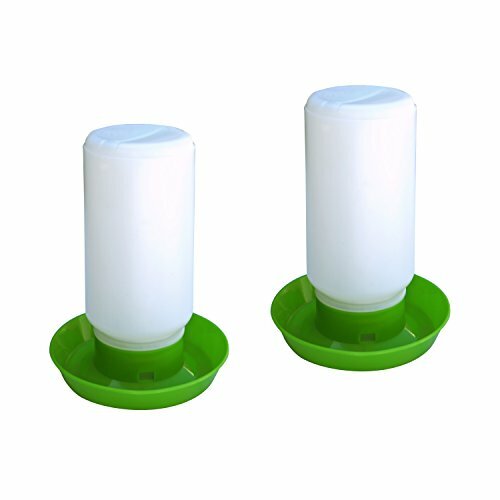 -Heavy duty castors for easy moving about. Cage Material: -Steel. Number of Items Included: -10. Dimensions: -The height of the cage off the ground is 8". Overall Height - Top to Bottom: -71". Overall Width - Side to Side: -24". Overall Depth - Front to Back: -24". Overall Product Weight: -135 lbs. 1705004905 Color: Pearl White Features: -Bird proof door locks. -Stainless steel outside access food cups. 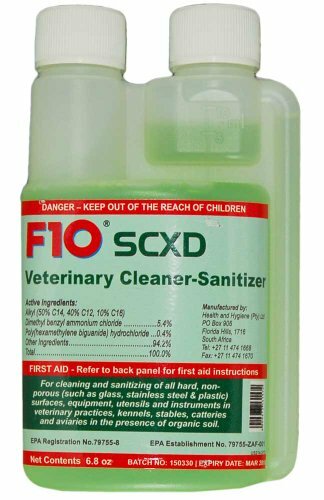 -Easy to clean. -Powder coat finish in high gloss designer colors. Color: -Pearl White. Cage Material: -Steel. Number of Items Included: -22. 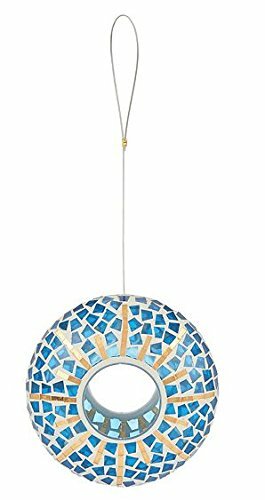 Dimensions: -Casters make the overall height: 61.5". Overall Height - Top to Bottom: -60". Overall Width - Side to Side: -48". Overall Depth - Front to Back: -34". Overall Product Weight: -223 lbs. Copyright © Wholesalion.com 2019 - The Best Prices On Avian Bird Bowl Online.